When a widget/form is published on a website and a record is submitted, does that record populate in the main database? I need an email to discuss my project with. Just wondering can I link the MTH frontend onto an already existing MySQL database? I am doing ok creating my DB…but I am stumped as to what widgets are, and what I should, Or can do with them. Please enlighten if you can. I am a paying member. I think that MTH will be able to do most of what I am looking for but, whilst it may be an easy interface for people with more technical skills than me, I am finding it quite difficult without a tutorial that shows you how to get started and what each of the choices in the fields options and advanced options do! I have no idea what ‘Validate on submit’ means or ‘FORMAT (REGULAR EXPRESSION’ means or what to use it for. I am enjoying learning but I need to get my project up and running. Is there anyone that can help me put this together? I need help to create the user accounts, front interface and various reports etc. This is probably dead easy for someone with experience of the software but for me, I think it is going to take too long to learn each part to be able to make it work. Agent and manager can see all leads. I am able and have setup the fields and a few of the rules and formatting options but I need help with CSS and, report building. Is there a way to display calendar and time? I am trying to create a restaurant event reservation database and would like to view events in calendar format. Is there a way to filter records by user. I have a database with records initiated by a single person but assigned to suppliers. When suppliers login, I only want them to see the records of their company. Can I do this? Q1: Is it possible to use mathematics in forms. So that for instance if you have a list if items with prices could you set the database to calculate totals? Please could you point me in the direction of some tutorials or let me know. Specific Questions about security and others minute details. We currently use Terminalfour and Microsoft Access and both of them are falling apart or is not living up to our liking. So my small project for the small company is to migrate our database and our web content management system to a more streamline service. Is the Database PCI compliant? Can we upload our own document/template to make Reports? Can you make reports using different tables on the Database? Is it relatively simple to connect the Database and the CMS? Can more than one person access the database? Is there a wiki/documentation or some videos that may aid my development when working with MTH? I am looking for some information on the CMS and store you guys have avaliable. I currently have a WordPress website and am looking for a system which I can use which will have all the functionality I need for the business and reporting side of things plus the ability to be able to put the products in my database into my wordpress website and sell them from there. Is this something that is a possibility with your system? I have question abouw mytaskhelper. I created a second user en i set him only on read. But wen he log’s in he can still create a new database? how is it possible to remove that when he log’s in. I am trying to put together a database for an award that I run for a non-profit. I am somewhat tech familiar but I usually need someone to walk me through things the first time so I can get it. My husband is a techie and showed me a few things last night but I’m floundering today. Is there any way I could talk to someone on the phone and ask some questions to point me in the right way? We want to manage our project profile online on website for example our project is placed in five country each country have some specific project each project have profiles like 4 to 5 profile so we want to customer see our country first when he will click on particular country then show all project after click on particular project then show all profile related to this project. so please let me know how it is possible.with your software and there are any online support so we can easily understand my requirement.like skype or any other contact option like live chat etc. I am in the process of evaluating MyTaskHelper. The current software I am using (Appgini) has a search feature which unfortunately does not search and provide results of text contained within pdf files in my database. Is this something I can do with MyTaskHelper? To export data to PDF and print it you need to have a database. Create a view you need and in the Records menu click on the PDF icon. Exported data will be sent to your account email. 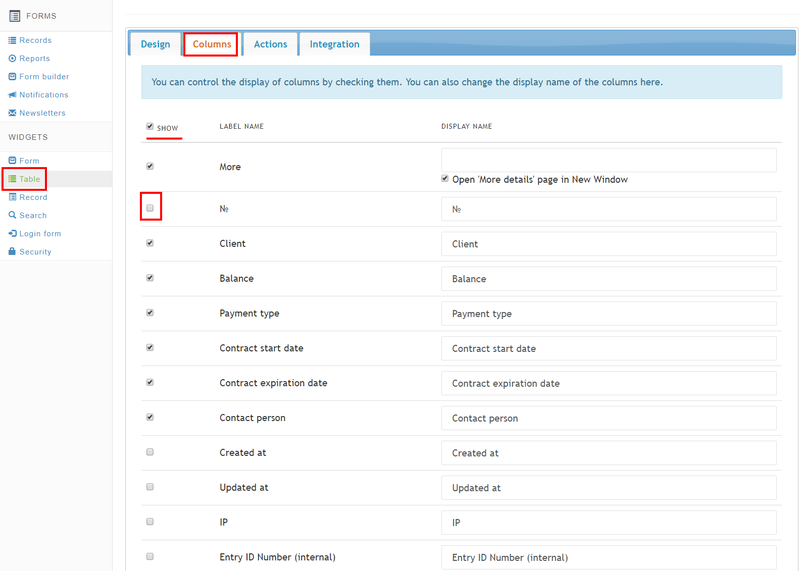 Please, see below how you can show or hide columns in your integrated database. It may be useful when some of the columns shouldn’t be shared with everyone, i.e. should be disabled. Can you have different views on the same database form? Say for example I want a set of records to be viewed in one case and edited in another? At the moment, there was a problem when adding new entries to the database with many records. In the case of a long delay, you can perform resorting base (bottom left button under the records). re-sort base may take some time, but after it all new records appears in the database. Can you help with this please. I have a acquired a new computer that I am keeping as virgin so that I can test applications. One issue that I have with my Record View html content is that IE8 and 9 display the Mixed Content message – which the only solution I know is to change the browser security settings. However, I note that on the QuintaDB web site your own examples do not have this message displayed in your demo databases. Should I be using a similar head content in my html? If so, what are the defaults? It seems that if QuintaDB calls Record View then the fact that it uses https and other links in the database are normal http that IE (fine in Firefox and Google Chrome) wants the user to respond to a badly phrased security message. For the time being I will insert a help link on the pages to explain the issue but we really should have a better work around that this. Is it possible for QuintaDB to either detect the existence of http calls and then use http to access Record View? Or is there some way that Record View be parameter set by the developer/user to use http? I know and understand this is not an issue of your making, however if users are to feature url links in their database and call these from Record View then QuintaDB should be able to facilitate this without having web site visitors be potentially frightened away from applications by a Microsoft message. It seems that the database search widget doesn’t work for people using iPhone or Macs. Would you be able to take a look at this? It would be great if you could change the database search widget. I’d love for it to be changed so there is only the option to search for “is” (and not select this from a list including “like”, “is not”, etc. Would that be possible? I have been thinking it would be very handy to be able to have more than one view displayed on my sites from the same database. I would like one where the administration staff can delete a record (for example)on one view, however the user cannot delete a record on another view of the same data. Is this possible within the existing framework? It will be very useful for the layout of the database to have Redirection features for Edit mode online. When I click “Edit” next to any table entry and after making changes click “Update”, I would prefer to be redirected somewhere else, rather than see Brief details of what I’ve just edited. Especially taking into account that it only shows those items that I have not specefied as hidden initially, not necessarely including the field that I’ve just edited. I’m sure other users will find it useful too. Since there may be many records on a page and there may be many columns per record, when a User scrolls-down a page, they may not remember what a particular column is for, so, they have to scroll back up to determine this. Please devise a way to “freeze” the column heading (like they can in a spreadsheet) such that, when they scroll-down, this column heading always shows. Way to filter the database without user intervention ? One database... different views ? Way to filter the database without user intervention ? One database… different views ?